The publication contains a selection of the works presented at the 5th STS Italia Conference, held in Milan from June, 12–14 2014. The main theme of this STS Italia conference’s edition was the intersection between Design Studies and Science & Technology Studies. 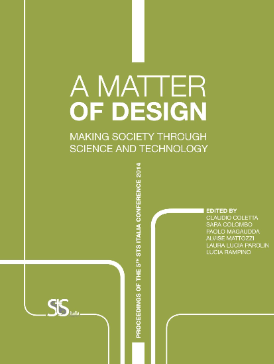 The Conference was the main event of STS Italia, the Italian Society for the Study of Science & Technology and the 2014 edition was organized in collaboration with the Design Department of Politecnico di Milano. Thanks to this cooperation, the conference was a unique space for interdisciplinary encounters between different scientific and intellectual milieus, which have interacted on very practical terms, fostering a reflexive account both in Design and STS practices.